Cannon Music Camp at Appalachian State University got off to a busy start during its first week with plenty of lessons, master classes, and a great concert on Sunday featuring several student ensembles (pictured at left is the Wind Ensemble horn section during rehearsal on the first day). All of the students have now had one lesson and a master class with me, so I have a better idea of who everyone is, and where they are in their musical development. During the first lesson I always ask students lots of questions, including what their short and long term goals are. Some of the goals students shared with me for their time at camp included working on tone, range, endurance, lip trills,and All-State audition repertoire. In addition to these goals I also encouraged all of the students to get into a regular warm-up/practice routine, even if only for 30 minutes or so per day during their busy schedules at camp. 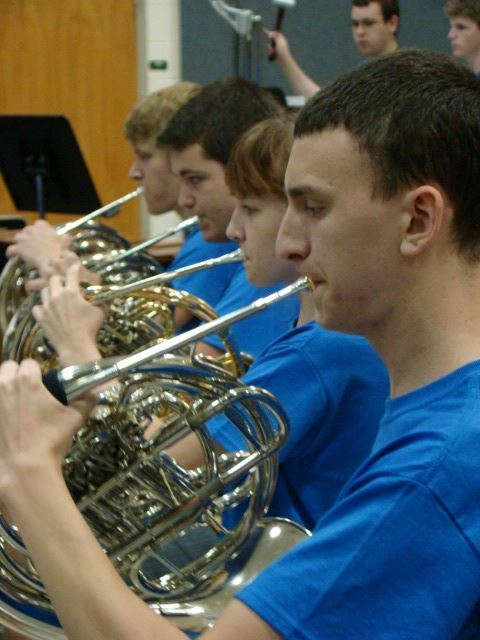 Taking care of your embouchure is really important during times of heavy playing, and a brief warm-up and maintenance period each day – along with a warm-down at the end of the day – will help keep everything working properly. All of the lessons so far have focused to some degree on fundamentals, as well as covering etudes, solo repertoire, chamber music, and large ensemble music. We’ve also been working a lot out of David Vining’s Long Tone Duets, which in addition to being great for warming up together at the beginning of lessons is excellent for improving intonation, tone quality, and deep breathing. All of my students at camp have expressed a desire to keep playing the horn beyond high school, and many of them want to major in music. For those students who want to major in music, especially the rising juniors and seniors, I emphasized the importance of taking regular private lessons, and getting serious about practicing scales and etudes, not just solos and audition music. During our first master class together I played briefly for the students, which generated some great questions about warming up and practice habits in general. After discussing some possible warm-up routines, I shared my list of recommended horn websites – at the top of the list were Hornmatters.com, International Horn Society, Hornplayer.net (now a part of the IHS site), hornexcerpts.org, and poprepair.com. I also took the opportunity to mention my own blog and YouTube channel! In this week’s master class we’ll talk about basic instrument repair and maintenance, and some recommended recordings for horn players. The campers ended a busy first week with a Kaleidoscope concert featuring brief selections by several ensembles. Bravo to all of the groups who performed, and a special congratulations to the horn players in the Wind Ensemble, Honors Brass Quintet, and Honors Woodwind Quintet. Keep up the good work! As we begin Week 2 I’m looking forward to working with everyone again in lessons and hearing some more great performances.